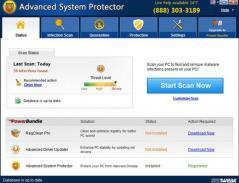 Advanced System Protector is a reliable antispyware application that can scan your computer to detect spyware, adware, browser hijackers, keyloggers and malware, as well as remove them. It’s also equipped with a real-time protection feature to prevent future infections. You can start a scan using several modes, namely quick, deep or custom. The custom mode allows you to select the system areas that should be scanned, such as the Registry, Windows settings, Internet cookies, and system memory. On top of that, you can exclude specific files or folders, schedule a recurring scan job, as well as set Advanced System Protector to automatically scan the system when Windows boots. The scan results display all threats found in each system area along with their status and severity. You can set the app to remove all threats at once or select only specific items.